Hydroxyzine is a medication that is used to relieve motion sickness, dermatitis, anxiety, and allergy. Hydroxyzine Overdose is the accidental or intentional intake of the drug in dosage higher than the prescribed values. Hydroxyzine Overdose is the accidental or intentional intake of the drug in dosage higher than the prescribed values. What are the Causes of Hydroxyzine Overdose? What are the Signs and Symptoms of Hydroxyzine Overdose? The signs and symptoms of Hydroxyzine Overdose can vary from one individual to another. It may be mild in some and severe in others. Several systems of the body, such as the nervous system, vascular system, respiratory system, and urinary system may be affected. How is First Aid administered for Hydroxyzine Overdose? Who should administer First Aid for Hydroxyzine Overdose? 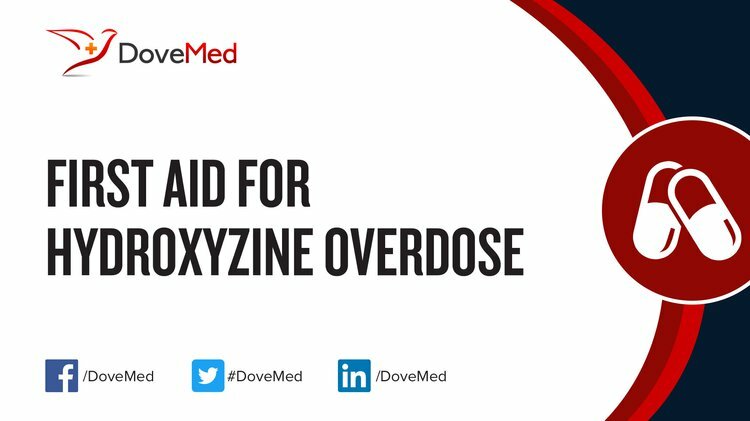 First aid for Hydroxyzine Overdose is administered by healthcare professionals. What is the Prognosis of Hydroxyzine Overdose? The prognosis of a Hydroxyzine Overdose is dependent on the amount of drug taken, time from overdose to treatment, severity of the symptoms, and general health status of individual who overdosed. How can Hydroxyzine Overdose be Prevented? Vigne, J., Alexandre, J., Fobe, F., Milliez, P., Loilier, M., Fedrizzi, S., & Coquerel, A. (2015). QT prolongation induced by hydroxyzine: a pharmacovigilance case report. European journal of clinical pharmacology, 71(3), 379. McIntyre, I. M., Mallett, P., Trochta, A., & Morhaime, J. (2013). Hydroxyzine distribution in postmortem cases and potential for redistribution. Forensic science international, 231(1), 28-33. Bucklin, M. H., Gorodetsky, R. M., & Wiegand, T. J. (2013). Prolonged lipemia and pancreatitis due to extended infusion of lipid emulsion in bupropion overdose. Clinical toxicology, 51(9), 896-898. Dasgupta, A., Tso, G., Johnson, M., & Chow, L. (2010). Hydroxyzine and Cetirizine Interfere With the PENTINA Carbamazepine Assay but Not With the ADVIA CENTEUR Carbamazepine Assay. Therapeutic drug monitoring, 32(1), 112-115. Dasgupta, A., Reyes, M. A., Davis, B. G., Marlow, A. M., & Johnson, M. (2010). Analytical performance evaluation of ADVIA Chemistry Carbamazepine_2 assay: minimal cross‐reactivity with carbamazepine 10, 11‐epoxide and none with hydroxyzine or cetirizine. Journal of clinical laboratory analysis, 24(4), 278-282. Sher, N., Siddiqui, F. A., Fatima, N., Perveen, S., & Shafi, N. (2015). New method development for hydroxyzine determination: application in stability studies, pharmaceutical formulations, and humane serum. Journal of Liquid Chromatography & Related Technologies, 38(8), 911-918. Toblin, R. L., Paulozzi, L. J., Logan, J. E., Hall, A. J., & Kaplan, J. A. (2010). Mental illness and psychotropic drug use among prescription drug overdose deaths: a medical examiner chart review. Journal of Clinical Psychiatry, 71(4), 491. Edriss, H., & Pfarr, M. (2013). Acute respiratory distress syndrome, metabolic acidosis, and respiratory acidosis associated with citalopram overdose. The Southwest Respiratory and Critical Care Chronicles, 2(5), 24-28.